Tottenham have won the race to sign Middlesbrough's England defender Jonathan Woodgate. Newcastle had revealed their desire in re-signing Woodgate, but the other interested club was unknown. 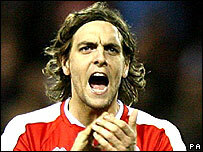 But Woodgate, who has played 16 times for Middlesbrough this season, has decided to join Spurs.